I would like to take a moment and wish you all a Happy Holiday season and I hope that they are merry and bright and that you will all be surrounded by the ones you love. Here are a couple of things that I made and took to the neighbors. 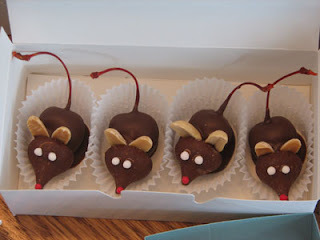 I was watching a local show and saw how easy it was to make these cute little mice (I made 75 of them in just a couple of hours). They have been a huge hit and everyone loves them. You can find the instructions and a video of the local show HERE. The packaging is from the craft store in the wedding aisle....they are little cake boxes that I added a band to them. I cut the label with my cricut and the Storybook cartridge. 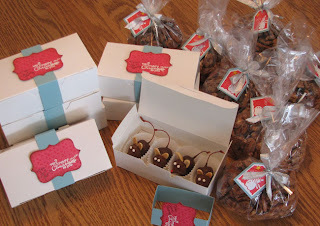 I also roasted some pecans with cinnamon and sugar and packaged them in clear bags with a cute little tag that I used an older Stampin' Up! set on and the tag punches. I have other things that I have been working on as gifts, but I will post them later (I don't want to give them away to the receivers). I also want to get the card done on the 2sketches4you website this week. BTW *toot toot* I made the COTW (card of the week) last week with my Friendship card that I had posted previously for Laura's card sketch #15. Hey Amy, those mice are simply adorable! they must taste real yums too :) Can't wait to see more and of your work and know you better on Apronstrings DT :) Congrats on making COTW and Merry Christmas ! Amy, I have never seen such good looking mice! :) Your neighbors are gonna love them! oh, I wish I was one of your neighbors... those are adorable.